Aphids, fruit flies, grasshoppers, caterpillars, and they eat each other when no food is available. The eggs are laid in groups. Each group of eggs is encased in a foamy substance that hardens into a tough protective casing called ootheca. Eggs hatch after 3 - 8 weeks, although not all eggs will hatch as young mantids. The young mantids are hatched as pro-nymphs. They are surrounded by a protective membrane and move like grubs to the surface of the ootheca. In some species, there is a single exit hole at the bottom of the ootheca, where the young emerge individually. In others, the young emerge through the oothecal wall nearest the egg cell and will hang on silken cord from the ootheca until the skin hardens. 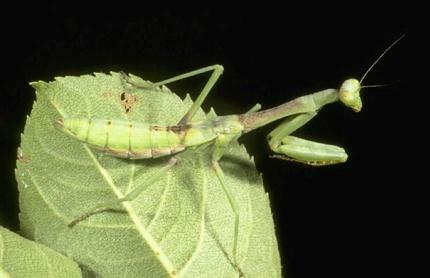 The adult praying mantis varies in color depending on the habitat it is living in. It camouflages the leaves, flowers, twigs, barks, trees where it is found. Its size varies depending on the species, from about 3 cm-18cm. It has strong spine-forelegs and usually sits and waits motionless among vegetation for prey, with its forelegs held together in a prayerful manner, hence the name 'Praying mantis'. It has strong mouthparts for chewing, large eyes, well-set on its mobile triangular head, with antennae that are slender and segmented. It has a neck that can rotate its head while waiting for prey. Some species have powerful forewings for protection and flying. While flying, it can be mistaken as for a small bird. Other species are wingless, odd-looking, flower/leaf-shaped, and others are so thin to be recognizedthat they are hardly recognizable. They will rise up in a threatening manners ready to attack, when disturbed. A female adult should be well fed prior to mating or else she will kill the male once she is hungry after mating. A female mantis lays up to a few hundred frothy liquid eggs in habitats where mantids live. Avoid indiscriminate use of pesticides, for pesticides kill and reduce the numbers of praying mantids and other beneficial insects. Maintain vegetation to provide natural habitats for the mantids.